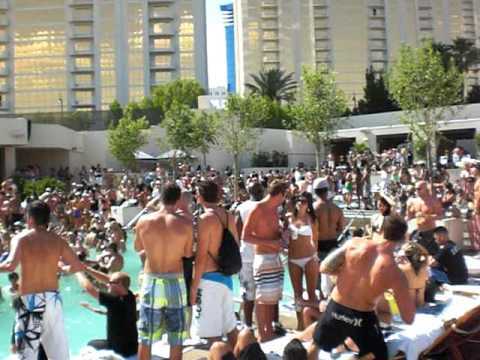 Wet Republic pool at the MGM Grand has earned itself a veteran status in the world of Las Vegas pool parties so it’s no surprise that the weekends here are packed full of party goers. As one of the longest standing pools in Vegas, Wet Republic never fails to provide one of the best day parties in town. The line to get in on a Saturday or Sunday says it all. That’s why getting your name on a guest list for free entrance for ladies and free or expedited entrance for gents is essential. Or better yet, indulging in bottle service is most definitely the way to go to ensure a good time. Trust us, we’ve made the mistake of showing up without being on a guest list or having pre-planned table service and quickly regretted the decision. Unless you want to stand by the crowded bar the whole time it’s a must you have your name on a guest list ahead of time. Being able to sit and soak up the sun is one of the best parts about day parties so spending a little extra cash on bottle service with a private cabana or table to relax in is always a good idea. Splitting the cost between a group makes the price for a daybed or cabana reasonable and definitely worth it. Wet Republic regularly hosts top-tier DJs such as Calvin Harris, Zedd and Tiesto so checking ahead of time for your favorites is always a good idea. With over 54,500 square feet of space including multiple cabanas, pools and a dance floor, you never know who you might run into. Another insider tip, in addition to pre planning bottle service or guest list, make sure you use the private Wet Republic valet entrance to prevent having the long walk from self park.